Damiano, originally from Salento, began his career in Paris and Strasbourg, followed by Spain and the United States. Traditional Italian flavors combined with unique touches are the distinctive elements of its cuisine. He loves experimenting and creating new combinations. Since two years he has been the as Executive Chef of the renowned restaurant L’Alcova, in the splendid Hotel Ca’Sagredo taking care not only of the restaurant and breakfast menu, but also the rich buffets of special events, such as the one tonight, for the presentation of the book ‘Women’ written by Uruguay born Milton Fernandez. On these occasions, will your menu be inspired to the theme and atmosphere of the event? Certainly. Today, as a tribute to the latin author, I prepared finger food with roast beef and lime, mini tacos and small empanadas that remind me so much of the tiny Pugliese panzerotti. Let’s talk about fish. Where do you shop? At the Rialto market. I rely on seasonality and suggestions from my supplier. From there I decide the menu of the day and make fish dishes that maintain the typical Italian cuisine, always keeping an eye to our international clientele, often with different tastes from ours. Today, an elderly Venetian told me that this market is becoming increasingly scarce and less stocked. It’s true? Unfortunately, yes, slowly it is reducing in extension and presence of sellers, a bit like the real Venetians that today are only around 50,000. Even the fishermen confirm that the fish choices have changed and the variety has shrunk. Delicacies like the schie … have become a memory. Today the request is primarily oriented on mussels, clams, sea bream, sea bass, king prawns, tuna, sword.. in other words ‘universally known fish’, available everywhere but preferred by tourists who generally fear experiencing tastes that they do not know. Yes, because I think it would be nice to let the customer try the local typicality. I find it genuinely useless to propose in Venice some American scallops, easily available even in New York! Amazingly good. We are supplied by the island of Sant’Erasmo, whose sale and removal was so successful that the Consorzio di Sant’Erasmo opened a sales outlet right here in Venice. We hope for good … too much success sometimes spoiled. A fish that you love to cook but which you gave up, given the doubtful reception of the international customer? I have no doubt; the spatula, which I would love to cook especially after my Sicilian experiences. Even my supplier told me ‘Damiano, the spatula is not so difficult to procure, but there is no request, I am sorry … pick up another fish’. It reminds me a bit of the phenomenon of globalization. 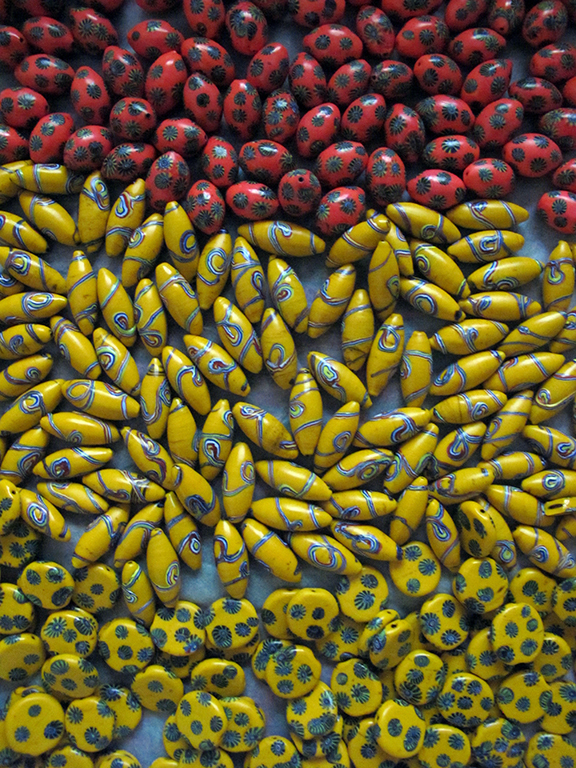 There are no artisan shops because of the large chains promoted by consumerism. So mothers or grandmothers who cook in a trattoria, are not there anymore? Well, I find them when I go back to my Salento. There is still some small osteria without a specific menu. Grandma cooks daily 2 or 3 dishes according to what she found at the market. And they are all spectacular! Almost never, I prefer to go out with friends, I rarely make a salad and if I am really in the mood, I make my favorite dish: spaghetti tomatoes and basil. I love simplicity! The top dishes of tonight’s menu? Spaghetti, zucchini and wild mint creamed with bottarga, then fresh sea bass sauteed with salt, oil and thyme and served on a summer panzanella with red onion and fresh gherkin. So there is a touch of Mediterranean heritage in your kitchen for the Serenissima? Of course, here I revive perfumes and tastes that I always keep in my heart, naturally adapting them to an international clientele of a certain level. About the Mediterranean thing… try my semifreddo with basil and my apricot mousse with rosemary …. Prosecco on the table, (with which I adopted with throughout the all dinner) and small varied sandwiches, including a delicious black fennel bread. As a starter a pie of beets, figs, almonds and mini melon balls. I’m not a big lover of sweet and sour, but I found it pleasant. Here is comes a more determined and tasty stewed moscardino with polenta, a typical Venetian dish. As pasta dishes, I tried the spaghetti with zucchini and mint, creamed with bottarga. Honestly I found the flavors a bit ‘disjointed, perhaps not very connected, I definitely preferred spaghetti with cuttlefish ink served with crispy cuttlefish, al dente, tasty, light and not too saturated of fishy flavor. Then a chef recommendation: fresh sea bass served on squares of a slightly acetate panzanella bread garnished with cherry tomatoes, cucumbers and red onions. a mousse with basil and a spectacular rosemary semifreddo. 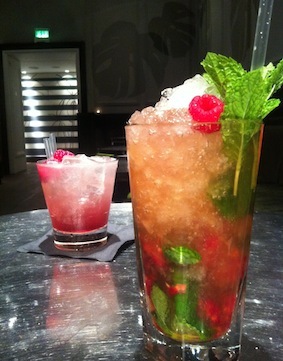 Fresh and refreshing, with an extra point to the rosemary! Buongiorno Cesare , sorry I literally have 5 minutes, i got to run to Mestre to sign the extension of showing ‘Support’. The sculpture she is referring to is the amazing (and controversial) ‘Support’ an artwork by Lorenzo Quinn, an Artist known to sculpture body parts, and especially hands. as these two giant hands rising from the waters of the Grand Canal ideally aiming to protect the façade of Ca’ Sagredo, one of Venice’s most beautiful and iconic buildings that risks sinking due to a changing climate. At the same time, however, they could destroy it and let the city sink at any moment, because “A hand could hold so much power, said Quin, the power to love, to hate, to create, to destroy. “Venice is a city of floating art that has inspired cultures for centuries, said Quinn, but in order to continue to be like this, it needs the support of our generation and the future ones, because it is threatened by climate change and the decay caused by time”.Inaugurated on May, the sculpture was supposed to remain there until November., but thanks to the combative pressure of Lorenza and her team, it is still standing and it will stay longer. The younger guys see the art as a positive message:.”Sure those hands are protecting our city” “Can’t you see? Venice is sinking, needs a support, I wish the hands would stay forever and I hope to see more of them to protect other buildings” Someone, more cynically went like “Nah, to me is the symbol of the invasion of too many tourist getting their hands on Venice and trying to steal its beauty” Finally an older lady told me ” C’mon the hands are innocent! those are baby’s hands! I guess she is right, the hands are the ones of a boy, as the model was Lorenzo’s son Anthony who is eleven years old. Ca’ Sagreto benefitted of a huge amount of pics, videos and selfies, stimulating the curiosity to visit and stay in the hotel . I did, I spend a great night in one of the room , facing the canal. 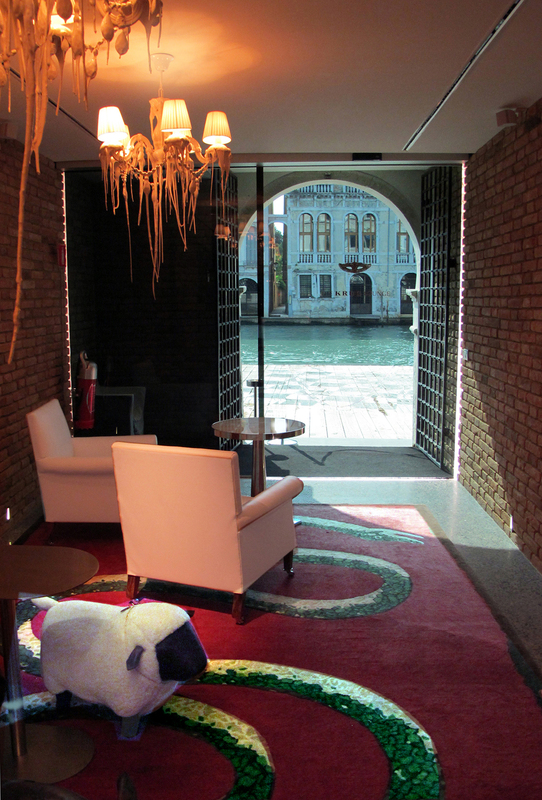 I was happy right from my arrival, welcomed by an enchanting lobby and a high-level reception where you can find all the information you need to be guided to discover the magic of Venice. My room was charming, with Venetian glass lamps, white marble bathroom, comfy bed, a private little terrace and a complimentary tempting selection of chocolates and truffles. In the morning I took a tour of the venue, excited to discovered the magnificent palazzo, which is the only Museum-Hotel of the City. The venue is a meticulously renovated 15th-century palace, with its lavish pink façade, between Ca’ d’Oro and the Rialto Bridge on the spectacular Grand Canal. I took me time to discover the extraordinary artworks throughout the palazzo. It is a real gem, half hotel, half museum with important works of art by 17th and 18th-century artists Sebastiano Ricci, Niccolò Bambini, Pietro Longhi and a beautiful Giambattista Tiepolo‘s canvas dated circa 1740. From every room and Suite you can admire the beauty of the lagoon city, the passage of Venetian gondolas and the roofs of romantic Venice. All accommodations have the most modern comforts from A/C to Wi-Fi. 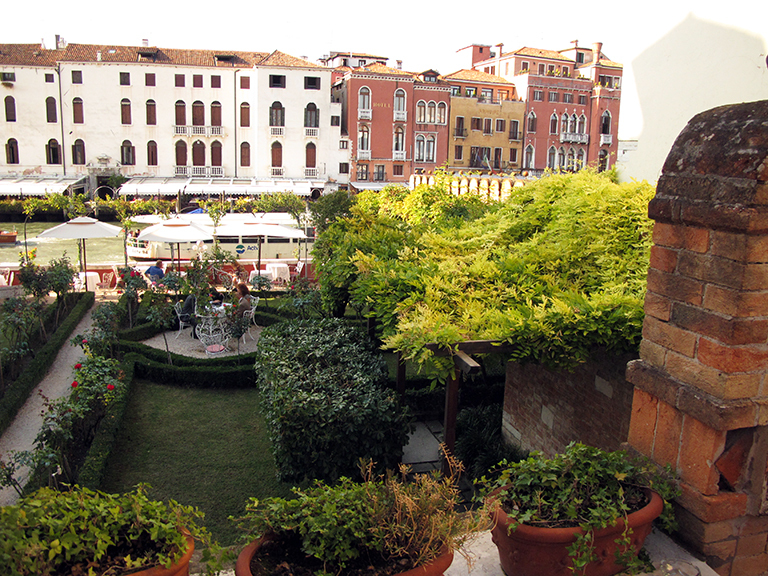 The rooms and suites are ideal both for a romantic visit to Venice and for a family to discover the Arts and Cultures of Venice. The breakfast was essential, but made with fresh and quality food, and served in the amazing Sala del Doge, where the ceiling holds a painting by Nicolò Bambini, depicting a glorious god Apollo from which the other characters try to find shelter. 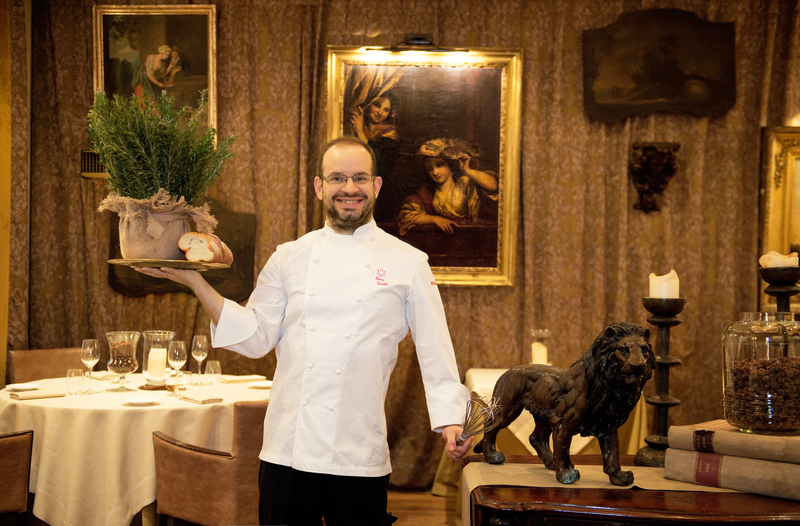 Unfortunately I had no time Ca’ Sagredo’s restaurant L’Alcova with its splendid panoramic terrace on the Canal Grande, featuring Chef Damiano Bassano who has worked in Paris, Strasbourg, Spain, USA and Spain in the three-star Michelin-starred restaurant Ferran Adrià, in Catalonia. and please…keep those ‘hands’ on! Ca’ Sagredo is one of the Small Luxury Hotels on the World. How to surprise your guests? Cook a tasty no-sugar, no-salt, no-fat dinner. The mission was to serve tasty dishes in which you do not notice the lack of fat, salt or sugar. 14 Chefs covered the challenge literally surprising the audience with their inventions cooked without all those three forbidden ingredients. I was particularly impressed by the juicy vegetal broth created by Chef Alessandro Gilmozzi, and used to make an excellent risotto. Alessandro for over 20 years, has been experimenting unusual ingredients from his mountains giving life to new gastronomic expressions able to leave an incisive mark on anyone who tries them.Among all the Chefs, I like to mention Oliwer Glowing, from ‘La Tavola, Il Vino e la Dispensa’ in Rome, Luca Marchini, from ‘L’erba del Re’ in Modena, Luca Veritti from Met Restaurant at Metropole Hotel in Venice, creator a really original menu called Tra Contemporary Cuisine, combining two philosophies: the traditional Italian and Veneto recipes, and a futurist style through which the same recipes are elaborated and proposed in a creative way. I should mention all of them, but I like to keep some secrets, teasing you to attend to the next edition of Gusto in Scena. The highlight of the evening? An amazine gallinella with vegetable bisque and spiced bread. Reach San Samuele Piazza and then venture yourself into a small calle street. You won’t find a hotel sign, just look for the bull!. That’s the entrance to a hidden paradise. 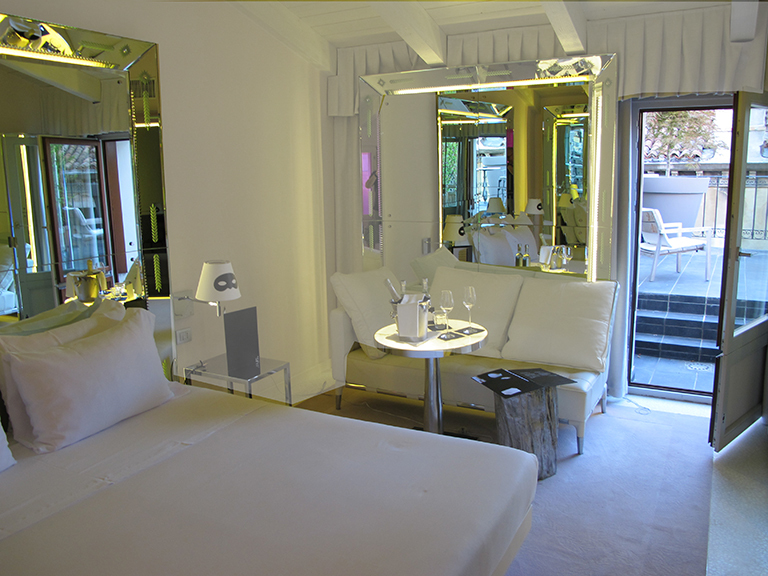 At Palazzina G everything is costumized, from a confidential check-in while sipping a drink, to your choice of pillows,to exquisite meals prepared a vista (under your eyes) by Chef Luigi Frascetta in a restaurantsurroundedby columns and different designer chairs. 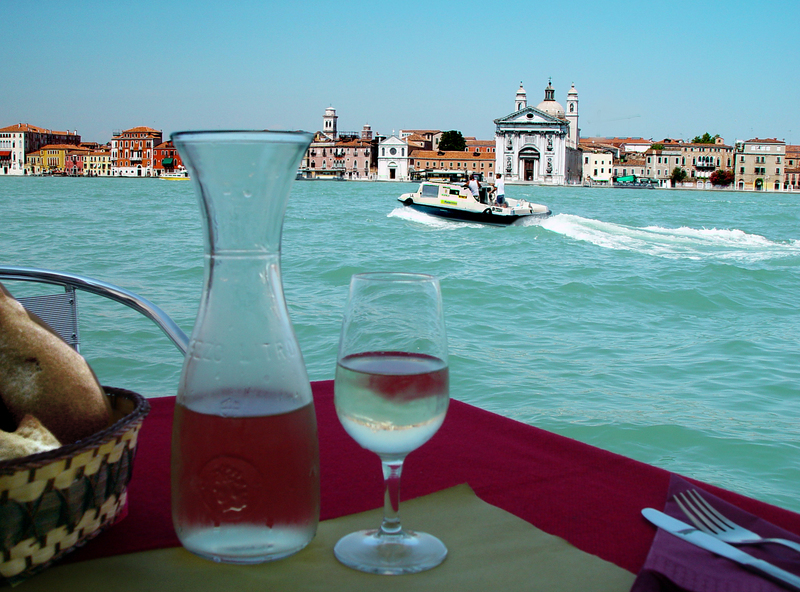 Trattoria Da Bepi adress Cannaregio, 4550 stop ferry Ca’D’oro. Le antiche carampane (where real venetians go) ) ph 041 5240165 Address :: San Polo, 1911, expensive, excellent, closed sunday and monday . ( tapas + wine) for a drink or aperitivo during the day, evening. FANS, FANS, FANS… Where? 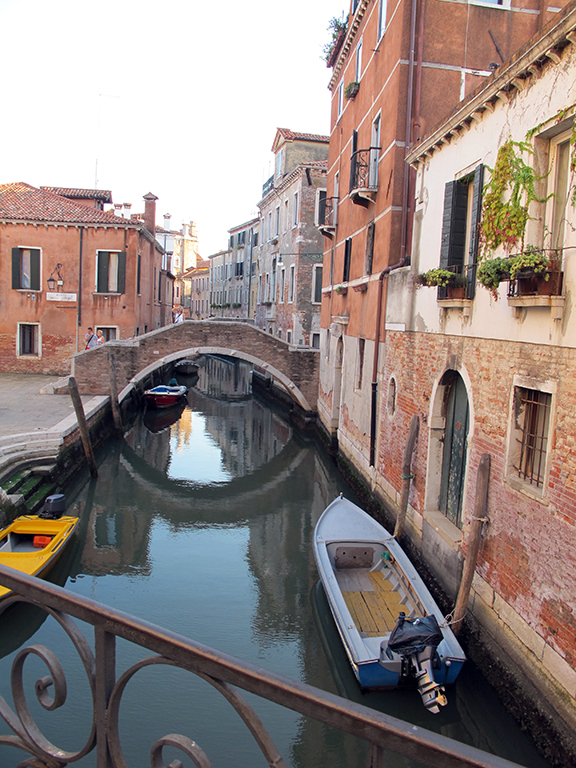 In Venice! Wherelse? Thanks to the passion for antiques and collecting of the Beggiato family, owners of the Hotel Metropole in Venice, and the precious association with the Palazzo Mocenigo Museum we may witness beauty and history in a unique exhibit showcasing some amazing fans from the Beggiato’s collection www.hotelmetropole.com Hand painted, lace, silk, tortoiseshell, mother-of-pearl… but also eclectic with ostrich feathers, this is without doubt one the most impressive collection in the world. 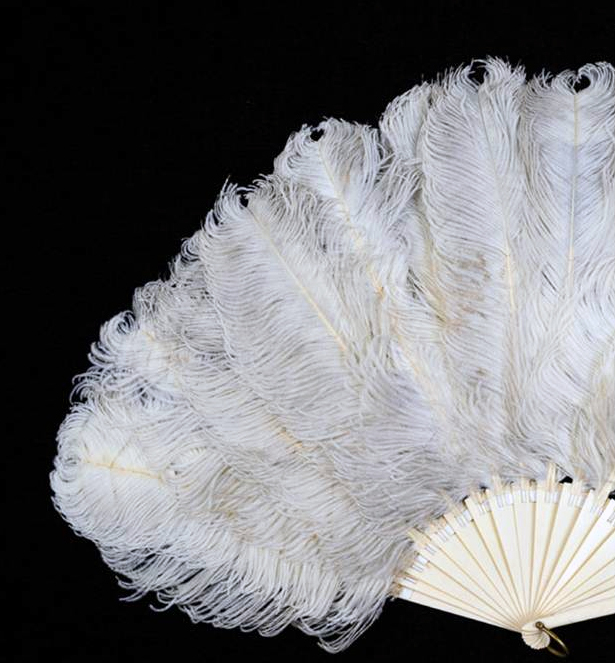 Made mainly in France, England and Italy, fans became popular in Europe between the 17th and 18th centuries. Considered for the most part as aristocratic and artistic objects with images painted both on the surface and the mounts, for a long time they represented indispensable accessories for upper class ladies who used the fan as a way of proclaiming their status and femininity. 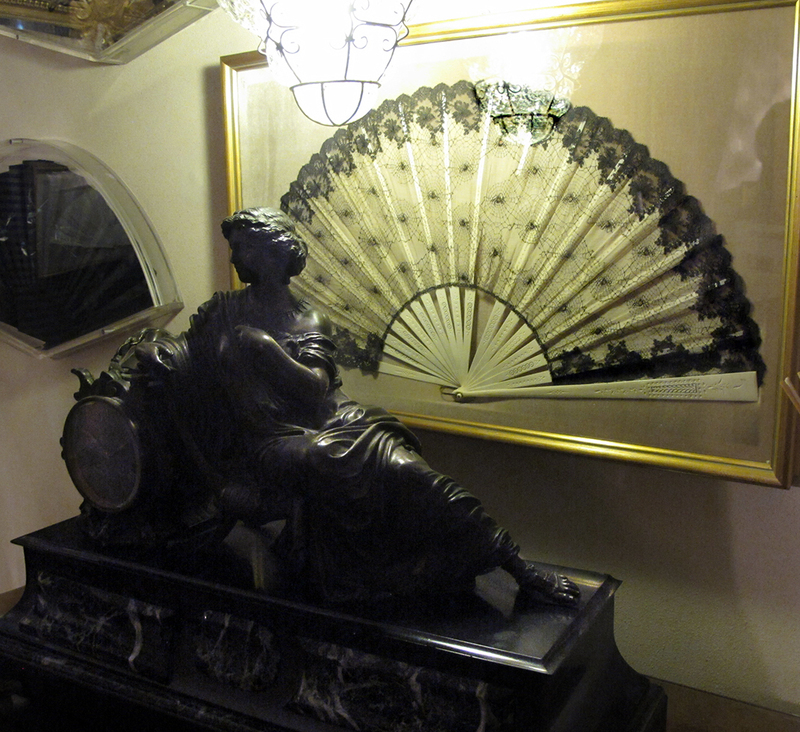 Once a year, the windows of the Metropole’s Oriental Bar become a luxurious display of Venetian excellence and help rediscover objects combining art, technique and fashion. Among this year artists, Marisa Convento presented Venetian Dreams, an amazing collection of necklaces, earrings, bags and corals created from the most beautiful Venetian glass beads as a tribute to the traditional crafts of Venice, once entrusted to the patient and creative hand of the “impiraresse” (bead workers). Despite hours of work Marisa aims to keep prices under control. For example, a stunning glass bauble on a cord costs about $75 and this elegant handmade bag is less than $250. Coming right from the sea…This spectacular necklace looks like a coral tree, but is actually made from minuscule red beads. It took two weeks of work! 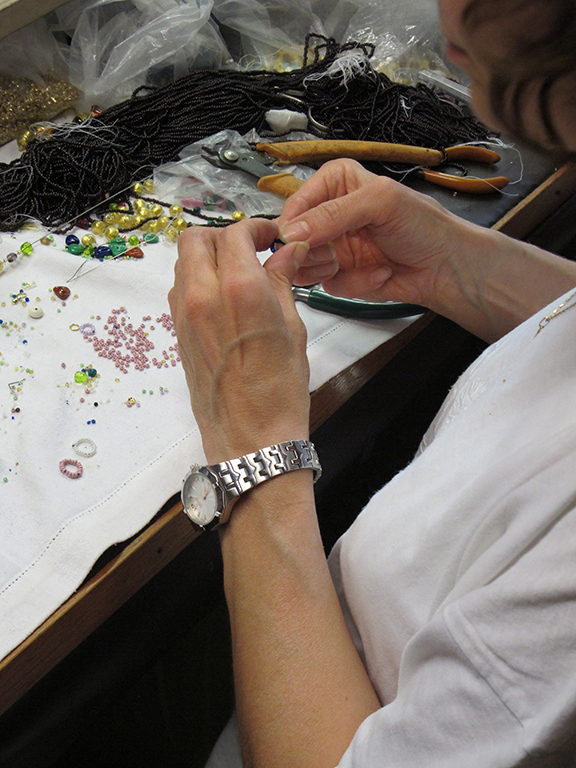 The glass beads are in fact part of the fundamental enormous artistic heritage that the city of Venice has produced over the centuries.